The St Croix Element heater comes in two forms within the same casing. The Element P (Pellet) has the versa-grate burner, and the Element MF (Multi-Fuel) uses the multi-fuel burn pot. This stove gives up to 40,000 btu/hr. in both versions, and is rated to heat up to 1,800 sq. ft. All that from within a footprint of about 20 by 20 inches. The Element P will burn any grade of wood pellet, cherry pits, or a half and half mix of wood pellets and corn, while the Element MF burns shelled corn, any grade of wood pellet, cherry pits, distillers grain pellets, wheat and rye. New to the St Croix Element pellet or multi-fuel heater is infra-red scanning technology which monitors the fire condition in the burn pot, and if anything abnormal is detected, will shut the stove down and diagnose the fault on an LED display panel. 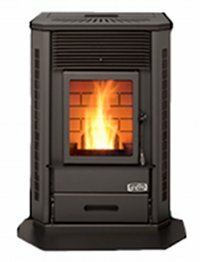 See St Croix Pellet and Multi-fuel Stoves for more information about the two grate systems. Automatic Ignition The St Croix Element P (pellet) has an igniter, the Element MF (multi fuel) must be lit manually using starter gel and wood pellets. Hopper Capacity The Element P holds 45 lbs. of wood pellets, the Element MF holds 50 lbs. of corn. Fuel Type The Element P can burn any grade of wood pellet, cherry pits, or a half and half mix of wood pellets and corn. The Element MF can burn shelled corn, any grade of wood pellet, cherry pits, distillers grain pellets, wheat and rye. Glass Air Wash No, it's recommended that the glass be wiped clean daily. Window Size 10.5 in. by 8.5 in. Rear Vent Height 8.5 in. Colours Black, with accents in matt black, gold plating or nickel plating. Automatic Shutdown and Re-ignition The Element P will shut down and re-ignite in thermostat mode. Not recommended using a pellet/corn mix because of the difficulty of igniting corn. The Element MF does not have an igniter. Original owner: Five years on steel parts excluding the burn pot, Two years on electrical components. The Element MF needs more attention than the Element P, Clinkers from the burn pot are dropped into the ash-pan manually. The versa-grate has a shaker system that automatically clears the burn-pot. No glass air wash means the stove window must be wiped clean daily. An infra-red sensor monitors the burn pot for abnormal burning conditions and will trigger diagnostics when maintenance is required. Daily: Drop the clinkers into the ash pan - twice a day if burning continuously on high. Daily: Check the air holes in the burn pot and shaker plate, clean if necessary. Rake the ash from the burn pot. Summer shutdown: Lubricate the versa grate shaker plate with high temperature anti-seize lubricant. Daily: Use the scraper rod to clean the heat exchanger tubes. Clean the viewing window. Weekly: Empty the ash pan, clean the air holes in the burn pot. Monthly: Remove baffle plate and clean the heat exchanger tubes. Clean the exhaust ash traps. Check the flue venting every two months during the heating season. Check the condition of the stove's gaskets. Summer shutdown: Remove all fuel from the stove and clean thoroughly. Sweep the venting system, vacuum motor compartment behind firebox, clean the convection and combustion fans. If you would like to leave a review of the St Croix Element, please use the form on the contact page.